There’s no doubt that own-label wines carry a certain stigma. Many of us wouldn’t dream of serving Asda Champagne at a celebration, or putting Morrison’s Chianti on the dinner table when friends are coming round. It’s not so much about what’s in the bottle, but what it says about us as hosts – or perhaps what it says about our guests! And yet despite the negative connotations, all of the supermarkets and bigger wine merchants have been expanding their own-label offering in recent years. Own-label now accounts for over 75% of the wine lines in Sainsbury’s I am told, while interviewed by a trade magazine in July of this year, Richard Weaver, Buying and Merchandising Director for Majestic Wine, said he saw no reason why their current 4% own-label share of sales couldn’t rise to 20% over time. There is an argument that such wines should represent ‘the best in class’: if a respected retailer is going to put their own name to a wine, it should be a flagship example. But there’s no doubt the real driving force behind own-label is profit. Not only does it cut-out some of the supply chain (normally deals are done directly between retailer and wine supplier, with no middle men), but less is spent on promotional budgets for hundreds of different lines. In what I guess are extreme cases, it also gives enormous flexibility to, for example, change suppliers each year: if a generic own brand Languedoc Chardonnay can be bought for a few cents less per litre from supplier X, then supplier Y can be dropped even mid-vintage without rippling the water. But some companies are using own label to deliver quality wines, often naming the producer on the label, even sometimes co-branded ‘in partnership with..’. I guess two wine suppliers spring to mind here historically: The Wine Society, whose ‘Exhibition’ wines are made by luminaries from Craggy Range to Jean-Louis Chave, and Marks & Spencer. Though these days they are more inclined to give the producers front-label billing, historically some great estates were the secret behind M&S-labeled wines. Today, most large merchants and chains have upmarket own-label brands, often representing very highly-regarded appellations and made by winemakers of international renown. 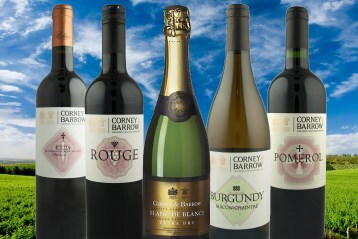 I was recently sent just part of Corney & Barrow’s strong own-label range, that spans prices from £7.50 to well over £20. Quality was good overall, with one or two stars, but given the Royal warrant-festooned nobility of the Corney & Barrow name, these might even be own-label bottles that you would be proud to have on your dinner table. (2017) At first glance this is classy looking with its gold label and 'Blanc de Blancs' the biggest message on the label, but scrutiny doesn't reveal much more except it is made in France, with the traditional method and is Extra Dry - which means sweeter than Brut. The Corney & Barrow web site reveals it is sourced from Savoie, but confusingly describes it as Chenin Blanc in one place, and Ugni Blanc in another. This was not my favourite wine of this small range: don't get me wrong, it is well-made and more than acceptable fizz, apple-scented and flavoured with a bready background, but the sweetness doesn't sit entirely happily with the acidity and the whole picture is just a tad non-descript. (2017) This organic-certified Chardonnay comes from the Mâconnais in southern Burgundy and is made for Corney & Barrow by the family domaine of Dominique Cornin. It has a correct, appealing nose, marrying lemon and peach, with the slightest undertow of almond or nougat. The palate has plenty of zip, a tropical almost mango-like juiciness moving through to the fresh squeezed lemon of the finish, medium bodied and of very fine quality. (2017) Though classified as a Vin de France, the fruit for this wine comes from the Languedoc, a blend of Carignan, Grenache and Merlot. It is boldly cherry and raspberry scented, the palate soft in tannins, medium bodied, and very much the epitome of easy-drinking with modest but sweet fruit and a nice, fresh finish. (2017) Made by Bodegas Zugober, not a name with which I am familiar, this is Tempranillo, with a little Graciano and Mazuelo, Crianza indicating it has had a little oak ageing. Smokiness on the nose, a touch of briar or underbrush, and a dark red plum fruit. There's a sour orange tang to the berry fruits on the palate, the cherry-skin of the acids also adding to that fine edge. This stays juicy and enjoyably sweet and sour into the finish. (2017) Made for C&B by the illustrious J-P Moueix of Pomerol, intriguingly the suggestion is that this is the perfect match for Murgh Tikka Makhani - a choice that surprised me, though I can see the logic in a wine with power and a bit of real grip that might well take on curry. Mostly Merlot, pencil-shaving notes over plum fruit, before a firm palate, the dark-toned fruit has a bit of bittersweetness, and the acidity gives the cut rather than the tannins which are sandy but not dominant. Claret really doesn’t go with curry. Frequent tadtings have shown that spice clashes with tannins, though the 14% alcohol might disguise! Adrian, I confess I did not try the combination, I just tasted the wine. I have had successful hot Indian curry matches with a seriously big, ripe and powerful Australian shiraz, but Bordeaux would never have occurred to me either!